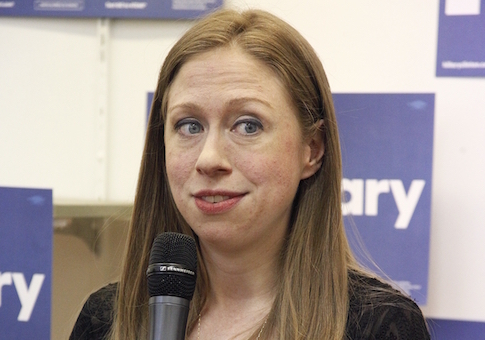 Chelsea Clinton took to Twitter on Tuesday to express her outrage at a CNN interview with Rep. Sean Duffy (R., Wis.), who said terror attacks carried out by the Islamic State pose more of a threat than those conducted by white terrorists. Clinton retweeted a post from Black Lives Matter activist DeRay Mckesson, who tweeted a video of the interview. Mckesson said that Duffy's answer arguing Islamic extremism is more of an issue than white terrorism "is exactly the problem." In the interview, CNN host Alisyn Camerota was admonishing Republicans for not including white terrorists in their dialogue as often as radical Islamic terrorists recruited by ISIS. Duffy said that is because ISIS attacks have spread throughout Europe and the Middle East, whereas white terrorist attacks, such as the shooting at a mosque in Canada last Sunday, do not have as much of a widespread resounding effect because they are not a part of a larger movement. Clinton, who may reportedly run for Congress, was infuriated by Duffy's response. But Duffy did say white extremists pose a threat, noting that such attacks are rarer than those carried out by ISIS, which have scattered refugees around the world. This entry was posted in Politics and tagged Chelsea Clinton, CNN, ISIS, Terrorism. Bookmark the permalink.